On any given day, cars rattle across the overpass above the Berkeley Amtrak station on Fourth Street. The clacking sound growls like thunder, momentary gaps of silence deafening. Away from the train tracks, a welcome poem is inscribed onto the rows of yellow concrete beams beneath the overpass. At the end of the poem, the viewer stands in front of a mural of dancing Ohlone Native Americans, wearing shell necklaces and feather-and-straw skirts, their faces somber. Between the individuals is a Chochenyo phrase in thin yellow letters: “mak roote ‘innutka hui_i_tak.” Follow our road to the future. A farewell poem continues on the opposite faces of the yellow beams. Facing the last beam is a mural that depicts contemporary Berkeley with the Amtrak train and the modern people of Berkeley. Amid the diverse group of modern-day people are more historical characters, such as Spanish colonizer Juan Bautista de Anza and George Berkeley, Bishop of Cloyne. Illustrated by artist John Wehrle, the murals, accompanied by Betsy Davids’ poem, debuted in 2008 under the city of Berkeley’s Civic Arts Program. The pieces, collectively called “Mak Roote,” honor the Ohlone, who lived at Strawberry Creek and the Bay Shoreline more than 3,000 years ago. Illuminated for all to view in a public space, the work is a testament to Berkeley’s complex history and its present-day diversity. It is surreal to stand at one of the most powerful spaces of the Bay Area’s local and cultural history and experience the vibrato of history as conveyed by public art. East Bay art glitters. 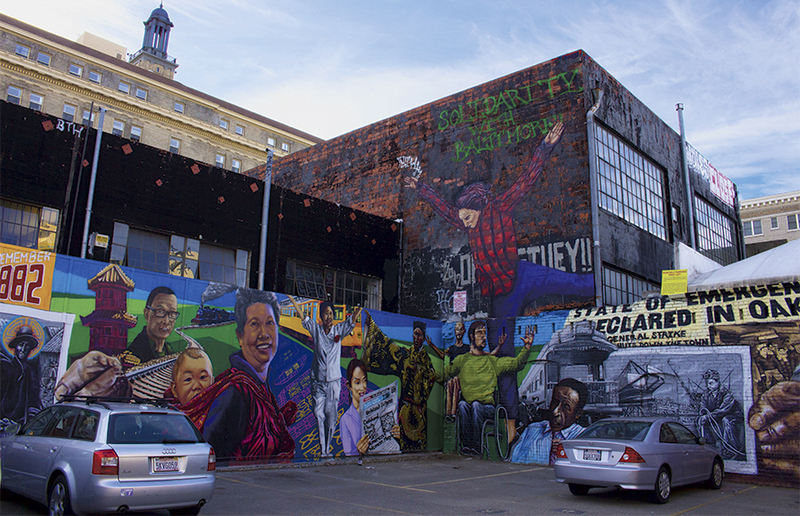 In Oakland, the arts play a vital role in forming and preserving community. The Oakland Art Murmur, a nonprofit organization consisting of visual art galleries and programming, is not only a local favorite but also an internationally recognized organization. Yet talk of culture and diversity feels cheap when the infrastructures for retaining and supporting local artists are, at best, precarious. In the East Bay, public art and its creators receive dismal support despite enriching public spaces. Systematic underinvestment in public art and public discontent has been enduring but glossed over. The East Bay draws attention with its arts scene, but current measures and institutions to maintain public art in the area look grim. 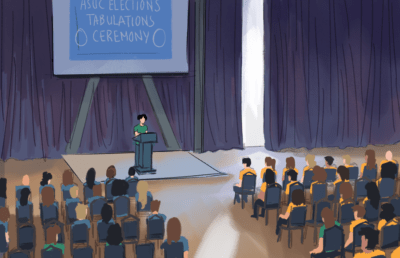 In the city of Berkeley, there is only one full-time staff member who deals with the arts. At the opposite end of the spectrum, San Francisco has a robust arts commission with about 40 staff members, who serve a population of more than 800,000. Financial support for the arts is difficult. Berkeley’s total budget for the arts in the 2016-17 fiscal year is $325,733. In Oakland, the budget for the Cultural Arts and Marketing Division is $1,660,896, although the Cultural Arts and Marketing staff manage more than public art. In San Francisco, an admittedly more affluent and populated city, the total proposed budget for the arts in the upcoming fiscal year is exceedingly larger — $15,311,787. San Francisco, although it has a larger population, budgets $18.28 per person, whereas Berkeley spends $2.79 per person, and Oakland spends $4.08 per person. According to a study by American for the Arts, nonprofit arts and culture in San Francisco generated $710 million in total economic activity. This spending provides for 19,744 full-time equivalent jobs and produces $508.9 million in household income for San Francisco residents. After discussions with many local artists, it becomes clear that frustration with the ailing support system for public art has bubbled over in the past year. The Bay Area may boast state-of-the-art technical innovations, but many wonder where the state of the arts stands and whether there is enough institutionalized support for the arts. What ails the public art scene in Oakland? Rising costs of living and doing business is an unsurprising problem. In July, the Rock Paper Scissors Collective, one of the last original founders of the Oakland Art Murmur, announced that it would be relocating because of rising rent costs. Additionally, the slow distribution of funds for art projects has also frustrated artists. 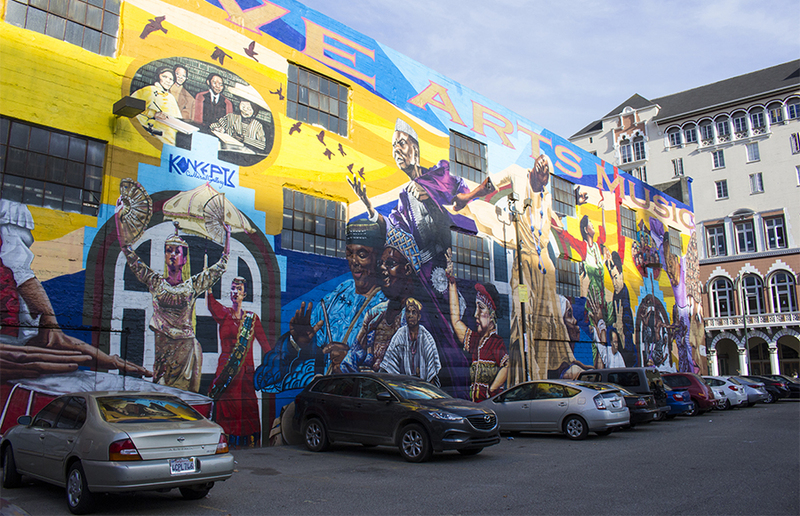 In 2013, Oakland City Council created a blight fund with $400,000, envisioning community murals as a possible alternative to graffiti abatement. After two years, only two projects have been funded and $14,100 allocated while the money remains largely untouched. Oakland City Council staff are not usually in charge of managing funds, and they have found the paperwork for creating contracts with artists especially difficult to navigate. I sat down with activist and muralist Desi Mundo in a small cafe in the Malonga Casquelourd Center for the Arts. He is unpretentious, yet speaks about his work with a persistent conviction. When I referred to him as a leader in his community, he denied the inflated designation. An Oakland resident for 15 years, Mundo is the executive director of the Community Rejuvenation Project, a nonprofit arts organization in Oakland devoted to painting community murals and developing arts policy recommendations and strategies. Mundo expressed his concerns about the gamut of problems faced in the Oakland arts scene. The bureaucratic chaos that Mundo referred to is the process by which the city of Oakland selects artists to fund for public projects. Mundo explained that even when selected by a panel, artists must go through a multimonth process before actually starting their project and receiving funding. He also pointed out that the cultural funding program that manages the arts is understaffed. For him, the solution for the atrophying state of public arts in Oakland boils down to the inclusion and consideration of artists in government decisions. Artists are often burdened with the weighty question: “Why does art matter?” It is a difficult question with a web of intricately related answers. Indeed, one of the most commonplace — and lofty — answers is that public art conveys the cultural vibrancy of a geographic area. Using public spaces, East Bay communities illuminate their histories and political activism with art and pose insightful questions. As I spoke with Mundo, he gestured across the street to the Alice Street Mural, which he completed with fellow artist Pancho Peskador. 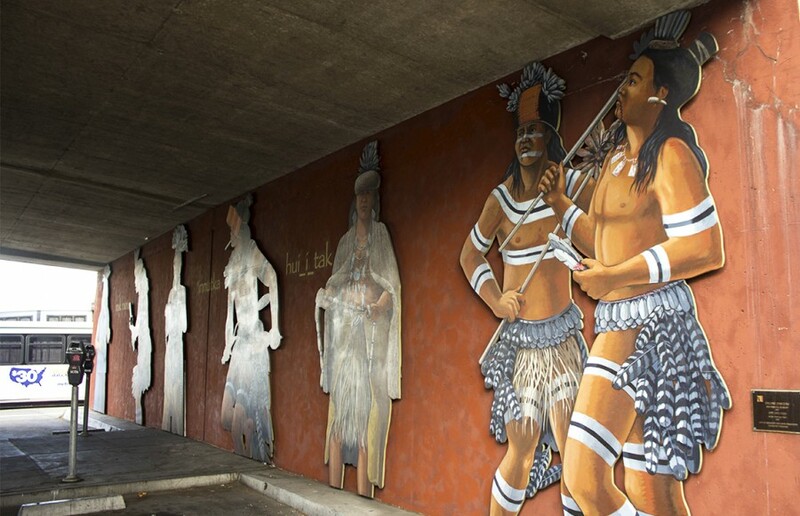 The mural honors prominent community members such as the Malonga family, dancer Carla Service, an Ohlone chief and community member Cephus Johnson, and features images, such as Chinese lions, that speak to the history of the neighborhood. In a naturally lit art studio at Berkeley City College, students drag stools across the floor. A woman with voluminous salt-and-pepper hair sits at a low desk facing me with her elbows folded. She exuberates a rich but relaxed panache. Her name is Juana Alicia Araiza. Many of her works reside in the Mission’s Balmy Alley and places such as Pennsylvania, Mexico and Nicaragua. Currently an art instructor at Berkeley City College, Araiza is a seasoned muralist with an impressive career, which spans three decades. Her works meditate upon a range of issues, including human rights and labor. “I can only really talk about the way I do it — which is doing a lot of research, working with community and (having) dialogue with other artists … or with my students,” she added. Araiza founded and currently facilitates the True Colors Mural Projects with her students. Collaborating with director Taiso Araiza, True Projects members and several volunteers finished the mural “From the Ground Up” last year to commemorate Berkeley City College’s 40th anniversary. Located in the city college’s atrium, the mural not only adds color and life to the space but also celebrates a history of education and community. In the piece, a girl, surrounded by cerulean waves, faces an open book, images of trees and community members juxtaposed on her left. Above her are bubbles that encompass moments such as learning and graduation. In addition to illuminating the history and political and social contexts of a space, public art also plays a role in driving cultural tourism and the economy. Luqmin Lin, a UC Berkeley alumnus and current medical student, said art in public spaces matters because it attracts visitors to an area. And it is not an insubstantial claim. In Oakland, nonprofit arts have generated more than $100 million in economic activity, according to a 2012 open letter from Pro Arts, an Oakland gallery. Fundamentally, however, cultural and historical roots inspired Lin. Joining urban aesthetic with traditional symbols, the medical student participated in Dragon School, a community service project in which youth spray paint golden dragons on walls to beautify Chinatown. Schaaf has worked on 1 percent for the arts ordinance since she was a council member. In the ordinance, developers would pay 1 percent of their project costs toward public art projects. The ordinance passed in December 2014, but in late July, regional builders sued the city. Builders argued that the policy violated their First Amendment rights because it required them to pay for speech, or art, that was not their own. Mary Ann Merker is Berkeley’s civic arts coordinator and the only full-time staff member dealing with the arts. She explained that each year, Berkeley allocates $240,000 across different nonprofit arts groups. It also has a yearly juried exhibition with 33 artists. If selected for the exhibition, artists are paid a modest $150. Merker pointed out that gentrification is a persistent issue in Berkeley, too. It is a point of concern for artists being displaced. Even in San Francisco, where the arts are much better supported, the problem is undoubtedly real. Recently, the San Francisco Arts Commission issued a survey and found that 70 percent of the 600 artists surveyed responded that they had been or are being displaced from their home, workplace or both. The survey also found that displacement was commonly business related, such as an increase in rent price or an entrance of new owners into a space. 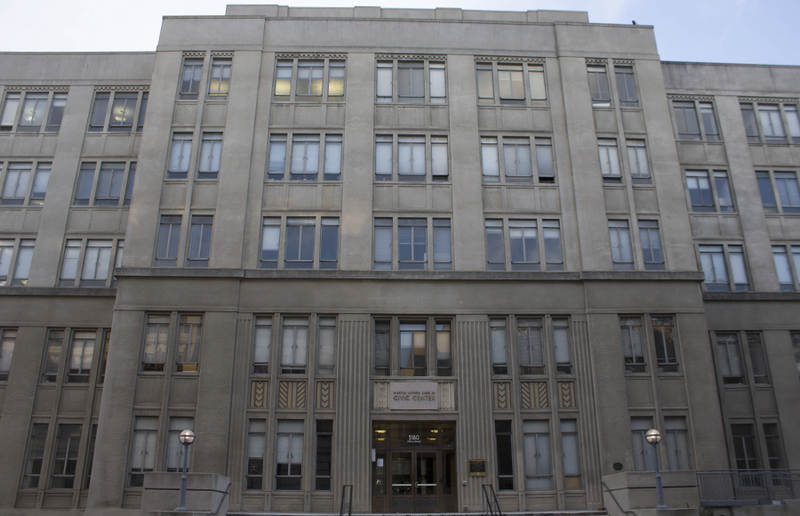 There is currently an ordinance for the arts in progress that specifically targets developers. It was approved in concept by Berkeley City Council in March. If the ordinance is implemented, developers would allocate 1 percent of building costs toward public arts. Contractors who opt out can put the 1 percent toward an in-lieu fund that may also be used to help artists and the arts. “Everyone wants to see this happen quickly, because sometimes in government, as you know, things take a long time,” she added. At the moment, the ordinance is being researched and assessed for its legality. It is tentatively scheduled to be ready by February. The mural by West Berkeley’s train tracks depicts many different people who allude to Berkeley’s roots — both its contemporary diversity and past complexities. It is no secret that the East Bay, as vibrant as it is today, was built upon a legacy of the displacement and disenfranchisement of Native Americans, as we are reminded by the representation of de Anza, the Spanish lieutenant who fought the Native Americans. Today, displacement takes a different form in the East Bay. As cities develop, artists and artwork are rendered vulnerable, lacking protection from gentrification and sustainable, reliable funding. While widely believed to be the keepers of the East Bay’s special culture and history, they are systematically overlooked. In times like these, the sound of the rattling overpass reassures us of our existence and the greatness of our advanced cities. But what kind of existence and at what costs to achieve greatness remain unclear. Whatever we do, we follow the road to our future.